Matthew Louis Gaetz II (/ɡeɪts/ "gates"; born May 7, 1982) is an American politician who has served as the U.S. Representative for Florida's 1st congressional district since 2017, where he is a member of the Budget, Armed Services, and Judiciary Committees. The district covers most of the western Panhandle, including Pensacola and his home in Fort Walton Beach. He is a member of the Republican Party. Prior to serving in Congress he was a member of the Florida House of Representatives, representing the 4th District, which includes most of Okaloosa County, from 2010 to 2016. He has also worked as an attorney in Fort Walton Beach, Florida. He is currently under investigation by the Florida Bar for allegedly intimidating a witness. Gaetz was born in Hollywood, Florida, to Victoria "Vicky" (Quertermous) and politician Don Gaetz, and grew up in the Fort Walton Beach area of Florida. His patrilineal Gaetz ancestors were immigrants from Beilstein, Rhineland-Palatinate, Germany to Wisconsin. He graduated from Florida State University in 2003 and from The College of William and Mary in 2007 with a J.D.. His father Don represented parts of Northwest Florida as a member of the Florida State Senate from 2006 to 2016 and served as Senate President from 2012 to 2014. Gaetz's grandfather, Jerry Gaetz, was the mayor of Rugby, North Dakota and a candidate for Lieutenant Governor of North Dakota at the 1964 North Dakota Republican Party state convention, where he died of a heart attack. In 2010, following the resignation of Republican State Representative Ray Sansom due to corruption charges, Gaetz ran in the special election to succeed Sansom in the 4th District, which included southern Santa Rosa County and Okaloosa County. In a crowded Republican primary that included Craig Barker, Kabe Woods, Jerry G. Melvin, and Bill Garvie, Gaetz won with 43% of the vote. In the special general election, Gaetz defeated Democratic nominee Jan Fernald, winning 66% of the vote. He was unopposed for a full term in 2010. In 2012, following the reconfiguration of Florida House of Representatives districts, Gaetz's district no longer contained any of Santa Rosa County. He was reelected, unopposed, in 2012 and 2014. 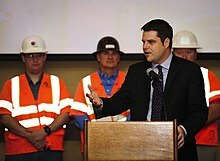 While serving in the state house, Gaetz joined with State Senator Joe Negron to propose legislation "designed to accelerate the execution of many of the 404 inmates on Florida's death row" by requiring the Governor to sign a death warrant for those inmates who have exhausted their appeals, noting, "Only God can judge. But we can sure set up the meeting." He also joined forces with State Senator Greg Evers to propose legislation that eliminated the federal ethanol content mandate that 10% of gasoline sold in Florida contain ethanol; the legislation was signed by Governor Rick Scott in May 2013. Following the trial of George Zimmerman for the shooting of Trayvon Martin, Will Weatherford, the Speaker of the Florida House of Representatives, announced that he would order hearings on the "stand-your-ground" law that was raised as an issue during the trial. Gaetz, the Chairman of the Criminal Justice Subcommittee, was tasked with reviewing the legislation, and announced before hearings that he would not support changing "one damn comma," though he indicated that he would listen to both sides' testimony during the hearings. Following the conclusion of the hearings, he authored legislation that would allow defendants who successfully used a "stand your ground" defense during their trial "to apply for a 'certificate of eligibility' to expunge information related to 'stand your ground' from their criminal records." When his subcommittee was considering legislation that would "keep mug shots of people who are charged with crimes off the Internet until they are convicted," Gaetz brought up his 2008 arrest for driving under the influence, arguing that his mistakes made him who he is and that publicly available mug shots "could be a problem for those unaccustomed to publicity." In 2013, Gaetz announced that in 2016 he would run for the 1st District state senate seat then held by his father, State Senator Don Gaetz, who was due to be term-limited out of the Senate in 2016. On March 21, 2016, Gaetz withdrew from the state race, choosing instead to run for the U.S. House seat representing Florida's 1st congressional district; the incumbent, Jeff Miller, had announced eleven days earlier that he would not seek reelection. On August 30, 2016, Gaetz won the Republican primary with 35.7% of the vote – defeating Greg Evers (21.5%), Cris Dosev (20.6%), and five other candidates. This virtually assured Gaetz of victory in the general election. The 1st District is the most Republican in Florida, and one of the most Republican in the nation. In the November 8, 2016, general election, Gaetz defeated Democratic candidate Steven Specht with 69 percent of the vote. He is only the seventh person to represent this district since 1933 (the district was numbered as the 3rd before 1963). On September 25, 2016, following the death of Miami Marlins' pitcher José Fernández, Gaetz criticized the athletes protesting during the national anthem in a tweet: "To all who will kneel during the anthem today – just remember how José Fernández risked his life just for the chance to stand for it". Gaetz was listed as a member of the moderate Republican Main Street Partnership from at least January to June 2017. Former NRA president Marion Hammer called Gaetz "one of the most pro-gun members to have ever served in the Florida Legislature." Gaetz is a "Lifetime Member" of the NRA, and has an A+ rating from the NRA—its highest rating. When Gaetz served in the Florida House of Representatives, he led an effort to allow Floridians with concealed-weapons permits to carry those weapons openly in public, which was ultimately unsuccessful. In lobbying for the passage of the bill, Gaetz said that the open carry of weapons was a right "granted not by government but by God." Gaetz supports Florida's stand-your-ground law and supported legislation that strengthened it against legal challenges. Gaetz also supports concealed carry reciprocity. In November 2017 Gaetz introduced a congressional resolution calling for Robert Mueller to recuse himself as Special Counsel because of what were said to be conflicts of interest. In the resolution Gaetz also asked for a Special Counsel investigation into the handling of the Hillary Clinton email controversy by the FBI, undue interference by Attorney General Loretta Lynch in the investigation, and the acquisition of Uranium One by the Russian state corporation Rosatom during Mueller's time as FBI director. Gaetz stated that he did not trust Mueller to lead the investigation because of Mueller's alleged involvement in approval of the Uranium One deal and Mueller's close relationship with the dismissed FBI director James Comey, a probable person of interest in a proposed new investigation. After Ohio Congressman Jim Jordan's denial that he was aware of the sexual abuse of Ohio State University wrestlers during the period when Jordan was a coach there, Gaetz said that the allegations came from people in the "deep state" and were intended to reduce the credibility of Jordan's criticism of Mueller's investigation of Russian interference in the 2016 United States elections. Gaetz said of then-Attorney General Jeff Sessions that "... over at the Department of Justice, he's got Stockholm Syndrome, he's become sympathetic with his captors over there in the Deep State." Gaetz supports rescheduling cannabis from a Schedule I drug to a Schedule III drug, enabling further research and expanded use of marijuana for medicinal purposes. In 2015 he sponsored a House bill to expand Florida's Right to Try Act to include medical marijuana. The bill as amended was approved by the governor in March 2016. In September 2017, Gaetz keynoted the American Medical Marijuana Physicians Association's annual conference. On February 23, 2017, Gaetz, worried about protesters disrupting his speaking at his town hall in Pace, Florida, prepared what his staffers called a "non-verbal town hall." Gaetz printed out part of his speech onto giant boards that he would hold up if he was unable to get a word in." One of the signs prepared for Gaetz had the words "Professional Liberal Protestors". Gaetz arrived 30 minutes late to the town hall meeting, where he faced at least 500 constituents crowded into a bowling alley. At the meeting he was grilled about his relationship with Donald Trump, his stance on repealing the Affordable Care Act, and his proposal to abolish the EPA. He said that Trump should release his tax returns, but stopped short of saying Congress should subpoena them. Gaetz closed his town hall by shouting Trump's 2016 campaign slogan, "Make America Great Again". In April 2018, Politico described Gaetz as "one of the most enthusiastic defenders of President Trump on cable news" and a "proud Trump protege". Aaron Blake of The Washington Post referred to him as one of Congress's "most controversial members," and one who has "unabashedly aligned himself with Trump on basically all things." Gaetz voted in support of the Tax Cuts and Jobs Act of 2017. He acknowledged that the bill's pass-through tax deduction would benefit President Trump, and added, "but so many Americans benefit when commercial real estate becomes easier and more accessible." In 2016, Gaetz acknowledged global warming but said he disagrees with the scientific consensus on climate change that human activity is the primary cause. Gaetz said "In our fervor to protect the environment, we lose sight of economic and scientific reality." In April 2017, the Center for American Progress and Vice Media said Gaetz was a climate change denier, citing his 2016 statements. In January 2017, Gaetz proposed legislation to, in Gaetz's own words, "completely abolish" the Environmental Protection Agency (EPA). He said, "our small businesses cannot afford to cover the costs associated with compliance, too often leading to closed doors and unemployed Americans. It is time to take back our legislative power from the EPA and abolish it permanently." In November 2017 Gaetz joined the bipartisan Climate Solutions Caucus. He said, "I don't think there's a scientific debate left to be had on if it is happening. I also think history is going to judge very harshly climate change deniers, and I don't want to be one of them." He said that he advocates technological innovation and economic incentives that address climate change, and increased federal funds for global warming research by NASA, NOAA and universities, but that he remains opposed to increased environmental regulation. In April 2019, after the House passed the resolution withdrawing American support for the Saudi-led coalition in Yemen, Gaetz was one of nine lawmakers to sign a letter to President Trump requesting a meeting with him and urging him to sign "Senate Joint Resolution 7, which invokes the War Powers Act of 1973 to end unauthorized US military participation in the Saudi-led coalition's armed conflict against Yemen's Houthi forces, initiated in 2015 by the Obama administration." The letter asserted that the "Saudi-led coalition's imposition of an air-land-and-sea blockade as part of its war against Yemen’s Houthis has continued to prevent the unimpeded distribution of these vital commodities, contributing to the suffering and death of vast numbers of civilians throughout the country" and that Trump's approval of the resolution through his signing would give a "powerful signal to the Saudi-led coalition to bring the four-year-old war to a close". In October 2017, Gaetz said that the Medicaid expansion permitted by Obamacare fueled the opioid crisis. PolitiFact rated the claim as "mostly false", noting that "experts were universal in saying that the evidence that Medicaid expansion is somehow fueling the opioid crisis doesn't exist." Gaetz opposes sanctuary cities, which opt not to dedicate local law enforcement resources to prosecuting people solely for being undocumented. Upon announcing his run for Congress in 2016, Gaetz said that illegal immigrants were "sucking us dry." In January 2018 Gaetz defended a statement by Trump that Haiti and African nations were "shithole" countries, saying that Haiti was covered by "sheet metal and garbage" and in a "disgusting" condition. In October 2018, Gaetz falsely claimed that George Soros paid for a caravan of migrants from Central America to the United States. In its July–August 2017 issue, Foreign Policy reported that Devin Murphy, a Gaetz legislative aide, had written a resolution that Gaetz brought to the House Judiciary Committee using primarily content from /r/The Donald, "a pro-Trump subreddit notorious for both its embrace of conspiracy theories and its gleeful offensiveness." One of the allegations was that James Comey had leaked investigative matters to New York Times reporter Michael S. Schmidt, beginning when Schmidt would have been around 10 years old. In an email to Wired magazine, Gaetz said, "It is the responsibility of our staff to gather as much information as possible when researching a subject and provide that information for consideration. We pride ourselves on seeking as much citizen input as possible." The /r/The_Donald posters' suggestions are represented in "roughly two-thirds of the total finished amendment." In January 2018, Gaetz invited alt-right Holocaust denier Charles C. "Chuck" Johnson to attend President Donald Trump's State of the Union address. Gaetz said that he had no "pre-existing" relationship with Johnson and only invited him to attend when Johnson showed up at his office, providing him the ticket which Gaetz's father could not use due to his bronchitis. According to Johnson, he was invited by several members of Congress but “took Gaetz’s invitation” because “he’s into stuff on the issues that I care about.” Johnson had previously raised money for the neo-Nazi website The Daily Stormer. Gaetz said in an interview that Johnson was “not a Holocaust denier, he’s not a white supremacist”. In 2008, Gaetz was arrested for a DUI as he was driving back from the Swamp, a nightclub on Okaloosa Island, Florida. Although during the arrest he refused to take a breathalyzer test, his driver license wasn't suspended for his refusal, as required by Florida law. Gaetz's refusal also did not lead to a criminal prosecution, where it could have been used against him. Charges against him were dismissed, despite the fact that the police reported that he had shown physical signs of intoxication. Gaetz cited the dropped charges as proof that he was innocent. Between 1999 and 2014, Gaetz received 16 speeding tickets in Florida. On February 26, 2019 – the night before the scheduled public hearing of Michael Cohen, Donald Trump's former personal attorney, before the House Oversight Committee – Gaetz directed a tweet toward Cohen that implied without evidence that Cohen had had multiple extra-marital affairs and also suggested his wife might be unfaithful while he was imprisoned due to new information disclosed to her. The tweet was seen by other members of Congress as an attempt to intimidate a witness. After their sharp criticism – and an implicit rebuke by House Speaker Pelosi – Gaetz deleted the tweet and posted a tweet in which he apologized. During the hearing, Oversight Committee member Stacey Plaskett, a Democrat, emphasized her background as a prosecutor and counsel on House ethics and recommended that Gaetz be referred to both the House Ethics Committee and criminal prosecutors over witness intimidation and tampering. Following the tweet, The Florida Bar opened an investigation into Gaetz. ^ "Full Name: Matthew Louis Gaetz II". Voterrecords.com. Retrieved 2018-02-05. ^ a b c Flynn, Meagan; Bade, Rachael; Thebault, Reis (February 27, 2019). "Rep. Matt Gaetz insists he didn't threaten Michael Cohen. The Florida Bar is now investigating". The Washington Post. Retrieved February 27, 2019. ^ a b Shortell, David (February 27, 2019). "Florida Bar investigating Rep. Matt Gaetz for Cohen tweet". CNN. Retrieved February 27, 2019. ^ "Biography". Congressman Matt Gaetz. U.S. House of Representatives. ^ Menzel, Margie (November 9, 2012). "Five Questions for Don Gaetz". Sunshine State News. The News Service of Florida. ^ "Matthew Gaetz". Martindale-Hubbell. Retrieved July 11, 2015. ^ Colavecchio-Van Sickler, Shannon (March 30, 2008). "GOP lawmaker Don Gaetz is rising fast as a state Senate leader". Tampa Bay Times. Retrieved May 20, 2015. ^ Bender, Michael (February 21, 2010). "Florida House Speaker Ray Sansom resigns". The Palm Beach Post. Retrieved May 2, 2014. ^ Klas, Mary Ellen (April 25, 2013). "Florida House approves speeding up executions". Tampa Bay Times. Retrieved May 2, 2014. ^ Peters, Justin (November 7, 2013). "Meet the Uncompromising Ideologue Chairing Florida's "Stand Your Ground" Hearings". Slate. Retrieved May 2, 2014. ^ Flanigan, Tom (April 12, 2013). "Ethanol Fuels To Evaporate Under House Bill". WFSU-TV. Retrieved May 2, 2014. ^ a b Kaufman, Alexander C. (January 31, 2017). "Florida Congressman Drafts Bill To 'Completely Abolish' The EPA". HuffPost. Retrieved February 1, 2017. ^ McLaughlin, Tom (June 1, 2013). 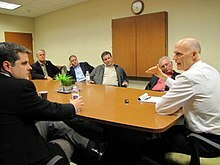 "Rick Scott Signs Ethanol Bill Repealing Required Percentage Statute". HuffPost. Northwest Florida Daily News. Retrieved November 3, 2017. ^ Van Sickler, Michael (August 2, 2013). "Weatherford calls for hearings on 'stand your ground'". Tampa Bay Times. Retrieved May 2, 2014. ^ Mitchell, Tia (August 22, 2013). "Matt Gaetz to rally base ahead of Stand Your Ground hearing". Tampa Bay Times. Retrieved May 2, 2014. ^ Mullins, Dexter (March 25, 2014). "Proposed 'stand your ground' amendment would expunge records". Al Jazeera America. Retrieved May 2, 2014. ^ Van Sickler, Michael (February 18, 2014). "Matt Gaetz wants to talk about his mug shot, but not his arrest". Miami Herald. Retrieved May 2, 2014. ^ Henderson, Jeff (May 13, 2013). "Matt Gaetz Makes It Official, Will Shoot for Dad's Senate Seat in 2016". Sunshine State News. Retrieved May 2, 2014. ^ Clark, Kristen (March 21, 2016). "Matt Gaetz launches bid for Congress, handing fathers state Senate seat to George Gainer". Miami Herald. ^ "Florida House Races Results". Politico. Retrieved September 6, 2016. ^ "Florida U.S. House 1st District Results: Matt Gaetz Wins". Retrieved 2017-08-02. ^ @MattGaetz (September 24, 2016). "To all who will kneel during the anthem today - just remember how Jose Fernandez risked his life just for the chance to stand for it" (Tweet) – via Twitter. ^ "GOP Lawmaker Matt Gaetz Ripped For Tweet Politicizing Death Of MLB Star Jose Fernandez". The Huffington Post. Retrieved September 27, 2016. ^ "Meet Three of Our Freshmen Members: Reps. Gaetz, Rutherford, and Marshall". Main Street Advocacy. Republican Main Street Partnership. January 27, 2017. Retrieved April 26, 2018. ^ "Members". Republican Main Street Partnership. Archived from the original on January 30, 2017. Retrieved November 19, 2018. ^ "Members". Republican Main Street Partnership. Archived from the original on June 27, 2017. Retrieved November 19, 2018. ^ "Membership". Republican Study Committee. Retrieved April 3, 2018. ^ a b "Meet Matt Gaetz". Gaetz for Congress. Friends of Matt Gaetz. Retrieved 22 February 2018. ^ "Florida GOP candidate to give away semi-automatic rifle". Chicago Tribune. Chicago, Illinois. 20 June 2016. Retrieved 22 February 2018. ^ Clark, Kristen (6 October 2015). "Openly carry guns in Florida? Bill clears first hurdle in state House". Miami Herald. Miami, Florida. Retrieved 22 February 2018. ^ Hiaasen, Carl (17 October 2015). "Carl Hiaasen: from God's lips to Gaetz's ears". Miami Herald. Miami, Florida. Retrieved 22 February 2018. ^ Call, James (6 October 2015). "Gaetz: Open carrying of guns is a right granted by God". Tallahassee Democrat. Tallahassee, Florida. Retrieved 22 February 2018. ^ a b Gaetz, Matt (17 January 2017). "Rep. Gaetz: Second Amendment not negotiable". Pensacola News Journal. Retrieved 22 February 2018. ^ Perticone, Joe (November 3, 2017). "Republicans just introduced a resolution to remove Mueller from the Trump-Russia investigation". Business Insider. Retrieved November 3, 2017. ^ Demirjian, Karoun (November 3, 2017). "Conservative Republicans demand Mueller recuse himself over uranium deal". The Washington Post. Retrieved November 3, 2017. ^ The conservative case to fire Robert Mueller, explained, Vox, Alex Ward, December 14, 2017. Retrieved July 9, 2018. ^ GOP lawmaker calls for Mueller recusal over uranium deal, The Hill. Christina Marcos, November 3, 2017. Retrieved July 9, 2018. ^ "Jim Jordan is accused of turning a blind eye to Ohio State sexual abuse. Now he's attacking the accusers". Vox. Retrieved 2018-07-06. ^ Representative Jim Jordan returns to Washington as scrutiny over alleged sexual abuse at Ohio State intensifies, Washington Post, Elise Viebeck and Alice Crites, July 9, 2018. Retrieved July 9, 2018. ^ "GOP lawmaker: Accusations against Jim Jordan come from 'deep state'". The Hill. July 12, 2018. Retrieved January 6, 2018. ^ "Tapper presses lawmaker: Who is the deep state?". May 22, 2018. Retrieved May 23, 2018. ^ Kennedy, Emma. "Matt Gaetz proposes to reschedule marijuana". Pensacola News Journal. Retrieved 22 December 2017. ^ Sweeney, Dan (October 8, 2015). "Florida Legislature tackling the three Gs: God, gays and guns". Sun-Sentinel.com. Retrieved 22 December 2017. ^ "Lawmaker wants terminally ill to have access to medical marijuana". Sun-Sentinel. Associated Press. October 7, 2015. Retrieved January 3, 2018. ^ "Scott Signs Medical Marijuana Bill for Terminally Ill, Enabling Experimental Drugs". FlaglerLive.com. Palm Coast, Florida. March 25, 2016. Retrieved January 3, 2018. ^ Wilson, Kirby. "Matt Gaetz to speak at medical marijuana doctors conference with Trump associate Roger Stone". Tampa Bay Times. Retrieved 22 December 2017. ^ a b Moghe, Sonia (February 23, 2017). "One Republican congressman's plan to deal with town hall disrupters". CNN. Retrieved February 23, 2017. ^ Strickland, T.S. (February 24, 2017). "At town hall, conservative lawmaker calls on Trump to release tax returns". The Washington Post. Retrieved February 24, 2017. ^ LoBianco, Tom (February 23, 2017). "Under fire, GOP congressman calls for Trump tax returns". CNN. Retrieved February 24, 2017. ^ Norton, Allie (February 23, 2017). "Gaetz meets with protesters during Santa Rosa County town hall tour". WEAR-TV. Retrieved February 24, 2017. ^ "Trump's Best Buddy in Congress Wants Sessions to Fire Mueller". Politico. Retrieved 2018-04-03. ^ a b c Blake, Aaron (February 26, 2019). "Rep. Matt Gaetz's very witness-tamper-y Michael Cohen tweet". The Washington Post. Archived from the original on February 27, 2019. Retrieved February 26, 2019. ^ Sarlin, Benjy (19 December 2017). "Republican-led Congress passes sweeping tax bill". WAVY-TV. Retrieved 22 December 2017. ^ Breaux, Collin (April 16, 2016). "Local political figures cautious about sea level rise". The News Herald. Panama City, Florida. Retrieved November 3, 2017. ^ Moser, Claire; Koronowski, Ryan (April 28, 2017). "The Climate Denier Caucus in Trump's Washington". ThinkProgress. Center for American Progress. Retrieved November 3, 2017. ^ "Florida's Climate Change Deniers". Vice Media. April 25, 2017. Motherboard. Retrieved November 3, 2017. ^ "H.R.861 - To terminate the Environmental Protection Agency". February 3, 2017. Retrieved February 23, 2017. ^ Valk, Steve (December 5, 2017). "Matt Gaetz, the Climate Solutions Caucus and the bumpy road to bipartisan consensus". Citizens' Climate Lobby. Retrieved April 26, 2018. ^ Baucum, Joseph (November 25, 2017). "After pushing bill to abolish EPA, Rep. Matt Gaetz joins Climate Solutions Caucus". Pensacola News Journal. Retrieved December 14, 2017. ^ a b "No evidence to prove Medicaid expansion fueled opioid crisis". @politifact. Retrieved 2017-11-04. ^ "No comprehensive data available to back Gaetz's claim". @politifact. Retrieved 2017-11-04. ^ Kam, Dara. "Matt Gaetz runs for U.S. Congress, blasts 'illegal immigrants' and 'Muslim terrorists'". Orlando Weekly. Retrieved 22 December 2017. ^ Mazza, Ed (16 January 2018). "GOP Lawmaker Matt Gaetz Slams Haiti: 'Sheet Metal And Garbage' Everywhere You Look". HuffPost. Retrieved 17 January 2018. ^ Qiu, Linda (October 20, 2018). "Did Democrats, or George Soros, Fund Migrant Caravan? Despite Republican Claims, No". The New York Times. Retrieved October 21, 2018. ^ Jurecic, Quinta (August 1, 2017). "The House Judiciary Committee Is Hard at Work Investigating Reddit Conspiracies". Foreign Policy. Retrieved August 2, 2017. ^ a b Feinberg, Ashley (July 18, 2017). "A GOP Staffer Crowdsourced an Anti-Clinton Resolution from Reddit". Wired. Retrieved August 2, 2017. ^ a b "GOP lawmaker condemned for inviting Holocaust denier to State of the Union". The Guardian. February 1, 2018. ^ Markay, Lachlan (January 31, 2018). "Florida (Congress)Man Invited Infamous Troll Chuck Johnson to Trump's State of The Union". The Daily Beast. Retrieved January 6, 2019. ^ Delk, Josh (January 31, 2018). "GOP rep invited alt-right activist to the State of the Union". The Hill. Retrieved January 31, 2018. ^ "Lawmaker's talk of mug shot raises questions about DUI arrest". Michael Van Sickler, Tampa Bay Times. Retrieved September 27, 2016. ^ Krauth, Dan; Heimeriks, Niels (July 25, 2014). "Some legislators rack up multiple speeding tickets, Scripps investigation finds". TC Palm. Retrieved December 16, 2017. ^ "Schedule – Week of February 25–March 1, 2019". House Oversight Committee. February 22, 2019. Archived from the original on February 27, 2019. ^ Gerstein, Josh (February 20, 2019). "Michael Cohen to testify Feb. 27 before House Oversight Committee". Politico. Archived from the original on February 22, 2019. Retrieved February 26, 2019. ^ Gaetz, Matt [@mattgaetz] (February 26, 2019). "Hey @MichaelCohen212 - Do your wife & father-in-law know about your girlfriends? Maybe tonight would be a good time for that chat. I wonder if she'll remain faithful when you're in prison. She's about to learn a lot..." (Tweet). Archived from the original on February 27, 2019. Retrieved March 29, 2019 – via Twitter. ^ Bade, Rachael (February 26, 2019). "Trump ally threatens Cohen with unsubstantiated allegation of womanizing". The Washington Post. Retrieved February 26, 2019. ^ a b Cillizza, Chris (February 26, 2019). "A high-profile Trump ally in Congress just straight-up threatened Michael Cohen". CNN. Archived from the original on February 27, 2019. Retrieved February 26, 2019. ^ Restuccia, Andrew; Samuelsohn, Darren (February 27, 2019). "Trump ally Gaetz apologizes for threatening Michael Cohen ahead of hearing". Politico. Retrieved February 28, 2019. ^ Pascus, Brian (February 27, 2019). "Rep. Matt Gaetz facing investigation over tweet about Michael Cohen". CBS News. Retrieved February 28, 2019. ^ Clark, Dartunorro; Reiss, Adam; Koenig, Kailani (February 26, 2019). "GOP Rep. Matt Gaetz apologizes for tweet targeting Michael Cohen". NBC News. Retrieved February 26, 2019. ^ "Rep. Matt Gaetz tweets cryptic warning to Michael Cohen ahead of hearing". CBS News. February 26, 2019. Archived from the original on February 27, 2019. Retrieved February 26, 2019. ^ "Dem lawmaker at Cohen hearing calls on Matt Gaetz to be 'referred for criminal prosecution' for witness tampering". Raw Story. 27 February 2019. ^ "Dem Congresswoman Suggests 'Criminal Prosecution' For Matt Gaetz at Cohen Hearing". ^ "Rep. Matt Gaetz facing investigation over tweet about Michael Cohen". www.cbsnews.com. ^ "Michael Cohen testifies before Congress: Live updates". www.cnn.com. 27 February 2019. ^ Contorno, Steve (February 27, 2019). "Matt Gaetz under investigation by the Florida Bar for Tweet at Michael Cohen". Tampa Bay Timest. Retrieved February 28, 2019.